A few decades ago no one would have believed that anything you need will be available instantly at the tip of your fingers. As the Internet evolved so did advertising, and most of the marketing efforts became focused on the World Wide Web. Any business can benefit from the Internet’s worldwide reach, whether it’s selling dresses, fixing the plumbing or truck financing. But the road to promoting your brand online is by no means an easy one. It takes a lot of effort, planning and expertise to set yourself apart from the competition utilizing the same resources. In this article, we are going to go over the basics of promoting your business online. Infographic showing methods to promote a business online. The first thing you need in order to build your online presence is a website. But not just any website. The domain name you choose has to be relevant to your company. Additionally, some domains will rank better than others. Ideally, you want to purchase a .com domain or if you are a local brand a local domain. The website has to be responsive and contain all the relevant contact information so your potential customers can reach you easily. With the rise of social media, many business owners tend to avoid building a website and focus all their efforts on Facebook and Twitter. 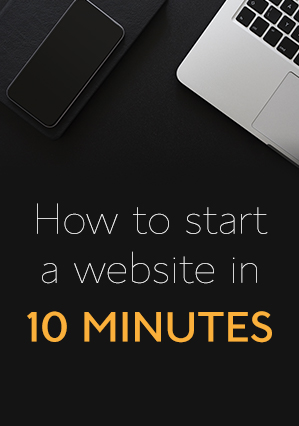 Even if having a website might seem like an unnecessary expense with all the free social networks around, not having your website is missing a big business opportunity.Ceating a website is very easy, here is a guide on how to start a website. We’ve all grown so accustomed for social media, that it has become the most effective way to promote any business, regardless of the size and the niche. Through social media, you can easily build visibility, recognition and brand loyalty, which will reflect in your sales. Most social networks offer promoted ads, which can help boost your visibility within the desired demo. Also, with the help of influencers, you can boost your reputation and gain new followers and customers. However, make sure your business fits the particular network, as some businesses might not fit right in on social networks like Instagram or Pinterest. A blog can make or break your online marketing efforts. Even though any business needs to have a blog to boost their online visibility, the blog needs to be meaningful and strike a chord with the right audience. Blogs can help you build a stronger relationship with your customers and increase your reach through shares on social media. You need to set up a schedule to ensure frequency and find the right way to advertise your products and services in a way that others will find useful. Apart from classic blogs, video blogs or vlogs are gaining momentum as well. A lot of effort regarding your website goes into creation and maintenance. Optimizing your website for better rankings on search engines such as Google, Bing or Yahoo is paramount in building your online presence. Since Google keeps upgrading its algorithms that help determine relevance, the trick is to stay in the loop and make your website relevant to both Google and your visitors through on-page and off-page SEO, quality content and relevant keywords. Want to read more about SEO? Newsletters are still one of the strongest marketing tactics, even if most companies nowadays tend to neglect them in favor of social media. Still, building a relationship through email marketing is invaluable and your business can benefit from relevant newsletters. But emailmarketing is a double-edged sword. You need to ensure your emails are unique and relevant and offer something your clients may benefit from, like a free report or eBook. Otherwise, they might end up in the trash folder unopened. Advertising your business through local business listing sites can give your online presence a significant boost. Each listing you create increases your chances of being found by new customers. Furthermore, the more sites you are listed on the more your visibility increases, as local listing sites share data. Listing your business can also improve your SEO efforts through backlinks and indexing your business on review sites can improve your credibility. Now that you have mastered the basics, invest into learning advanced internet marketing strategies. Developing an online presence is great, but it’s only the first step. You have to develop a unique edge, something your competitors don’t have in order to succeed on this long and winding road. If you want to build up best and successful money site for your business then you should choose the best SEO service, for your website and this not an easy task for a new person. So you can go to here at this http://seoanalytics.pro to find the best SEO service provider for your new website.